Since 2006 South Sound Paranormal (SSPR) has investigated claims of the paranormal in homes and businesses Washington and Oregon. As paranormal investigators, we document everything. If it moves, makes a sound, causes ambient temperature/pressure changes, or even if someone sneezes... it's documented. We seek natural causes first by whatever means possible before turning to paranormal explanations. We consider our client first and use the time allotted to us as efficiently as possible. We are dedicated to client confidentiality. We normally wear shirts with our logo and the name of the investigator on the front, but can be discrete at the clients' request. 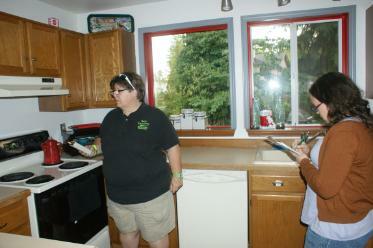 Patty and Jenny investigate a private residence. As paranormal investigators, it is our mission to be client focused. We conduct a criminal background check for all of our team members. We want you to feel safe when we come into your home or business, so it is important that each of our team members is an honest person with a great deal of integrity. Many of our investigators hold positions of trust in their day jobs, working for government agencies, police forces, and child advocacy groups, among others. When SSPR investigates your location, we do so after a comprehensive consultation. Following the investigation, we provide a detailed report that includes any audio, video, or photographic evidence, as well as documentation of personal experiences. All of our findings are confidential. At SSPR, we never charge for paranormal investigation or research. We seek to educate our clients and help them find ways to manage the anomalous activity they experience. Members of SSPR are extremely active in the paranormal communitie. People on our team frequently receive requests to lend their expertise to other projects. Members of SSPR spoke about haunted Lewis County at the Centralia Library. SSPR team members Patty and Billi appeared as paranormal experts on the feature documentary Montgomery House: The Perfect Haunting. Patty and Billi appeared on an episode of the Biography Channel's My Ghost Story in a segment about the Lewis County Historical Museum. Members of SSPR sat on and moderated panels at Crypticon Seattle 2014. Members frequently speak at paranormal conferences about an array of topics. SSPR was the first team to investigate two of Washington's most haunted hot spots: the USS Turner Joy and the Lewis County Historical Museum. SSPR has led or participated in kids' ghost camps to teach some techniques of paranormal investigation to a new generation. 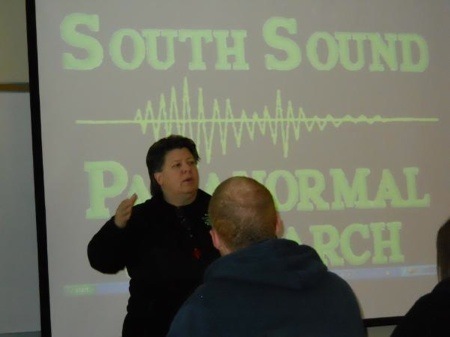 SSPR spoke in a college level psychology class about the paranormal at St. Martin's College. Melinda writes a column for Paranormal Underground Magazine about religion and the paranormal. Patty recently sat on a panel at the Oregon Ghost Conference with other leaders in the field including Michael White of PRI, Ben Robison of Autonomous Studies of the Enigmatic & Paranormal, Casey Goodwin of Oregon Paranormal, and Patrick Doyle and Jay Verburg of SyFy's Ghost Mine.